You must have realized that to draw sitting people is not easy, they can be more difficult to draw for some people. 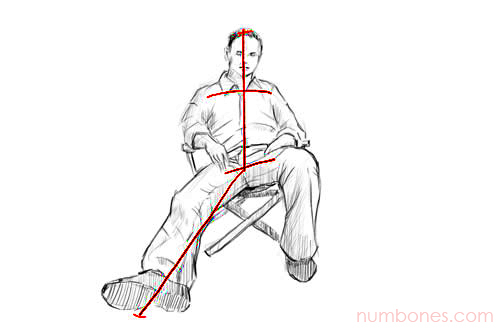 When new variables are introduced into images, such as chairs and foreshadowing, drawing a sitting figure can be intimidating. But we have good news for you, finally numbones.com found some basic techniques how to draw it. 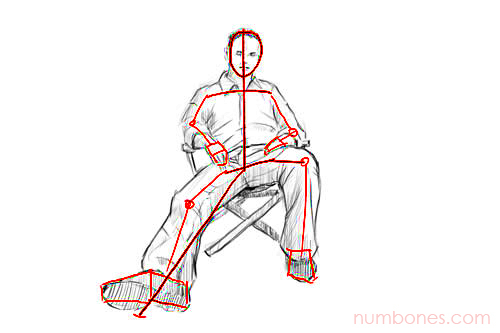 However, if you remember these simple steps to draw a sitting human figure, the level of difficulty will decrease. These simple steps will also show you how to draw a realistic person whole body, because basically they have some of the same basic methods. And if you have mastered some of these simple techniques, you can also teach them to others. You can even teach your child about how to teach a child to draw a person. Because the younger they learn to draw, the more expert they will become when they grow up. First, draw a baseline from the head to the foot of the person you are drawing. Because we will draw a person who is sitting, this line will probably bend at some point for the part of his leg. The purpose of drawing lines from head to toe is to ensure that we get all the images on paper and start thinking about our person proportion. Next, you have to determine where the person's shoulder and waist are. Then draw the baseline to show the location of each. The line for the shoulder and waist may be diagonal. But that's not wrong, because the shape of the shoulders and waist of a person sitting is indeed not straight. Now, you can draw a simple stick figure that is used as a baseline for drawing people. From here, we will finish the drawing. To start drawing people, you can start making body shapes first, such as drawing heads, bodies, and legs. Then finally, you just need to perfect the shape of the body into a perfect human image. Those were few basic techniques for drawing sitting person. After you master this basic technique and are able to draw people well, then teach others, including for kids. 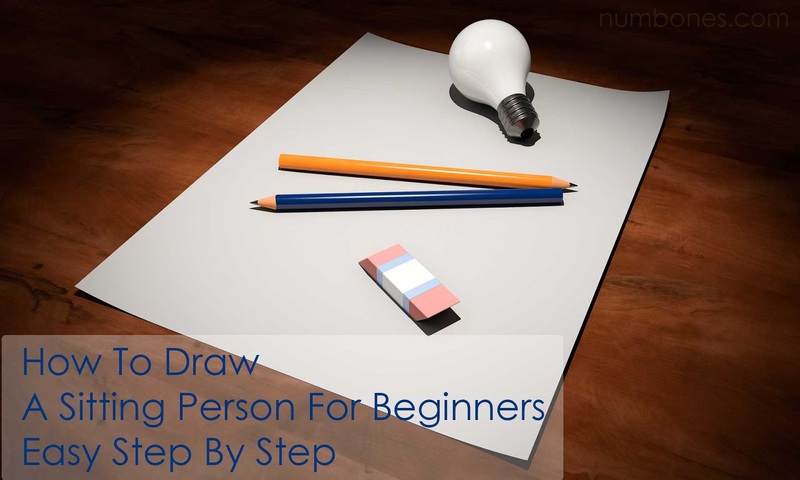 They also can certainly master it, because this is a drawing method that is easy for beginners to understand. After you can draw people sitting, you can also try to make another picture. Like drawing person standing, walking, or running. You can even try to draw cartoons. That's an easy way how to draw people sitting step by step. If there are still unclear, don't hesitate to ask in the comments section. 0 Response to "How to Draw a Seated Person for Beginners Easy Step by Step"